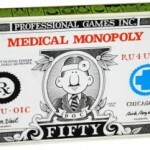 Last week’s post called medicine in the U.S. a monopoly. I took some heat for using that metaphor from some of my economist and journo colleagues, and realized that I needed to make a clarification: Medicine is a game of Monopoly, not a true economic monopoly. My very-snark-infested point was, and always is, that the pricing model in healthcare in this country is about as fair as a crap game or, perhaps, a round of Monopoly. More grist for my point arrived this week in the form of a TIME special feature, Bitter Pill: Why Medical Bills Are Killing Us. In it, reporter Steven Brill walks the reader through the chaos behind a veil of secrecy in healthcare pricing, starting with an under-insured man’s treatment at MD Anderson Cancer Center in Texas, which involved waiting – while wracked with the chills and fever caused by his non-Hodkin’s lymphoma – in a crowded hospital reception area until the check for his treatment cleared. He wound up having to use a credit card to pay $7,500 toward his medical costs before they’d initiate his chemotherapy. By the way, MD Anderson is a non-profit hospital. A close review of that man’s hospital bills revealed a 400% markup on many of the cancer drugs in his chemo treatments. Another example in the TIME feature is one involving a $21,000 false alarm – a woman was having chest pain, and was taken by ambulance to a local hospital. After testing, it was discovered that she was suffering from indigestion. The Medicare billing for the trip would have been around 80% less than what the woman – who didn’t have insurance – was billed for the hospital visit. However, since she was 64, and not eligible for Medicare, shewas billed $21,000. Yikes. At the root of the cost determinations in both of these cases is the hospital’s chargemaster list – the Great and Powerful Oz of that hospital’s billing structure. When pressed, hospital spokespeeps will say “no one pays those rates, they’re just a guideline” or “those lists have been around forever, we only use them as a reference” – but uninsured and under-insured people are asked to pay them. Hospital executive will also say that the pricing on the chargemaster list is justified by the fact that the hospital has to provide charity care to indigent patients. While it’s true that there are patients who can’t pay for the care they receive, the vast majority of patients are covered by either a private health plan, or Medicare, or Medicaid. The rates paid by those payers are negotiated with the hospitals. Why can’t an un- or underinsured person negotiate a fair cash price, too? The TIME story is a great read – it’s long, but it’s worth every minute of the time it will take you to read it. One patient story that stood out for me: a union guy in his 30s, with severe back pain, was treated by having a spinal-nerve stimulation device implanted. An outpatient procedure, with the nickel-and-dime hospital chargemaster billing adding up to $87,000 – the device itself, which wholesales for $19,000, was billed to the patient at $49,237 – put the patient over his annual health insurance coverage limit of $60,000. He was on the hook for $47,000 of that bill. Again, yikes. This trip down the medical billing rabbit hole pinged my radar in the same hour that a post by Brian Klepper on KevinMD.com did. It appears that the American Medical Association’s star-chamber price-setting committee, the RUC (about which I’ve ranted here before), has been given a pass by a federal appeals court in Georgia on having to hew to the same public-interest rules that govern other federal advisory groups. In other words, the AMA gets to continue to set healthcare prices by setting the dollar value assigned to each and every billing code in healthcare. Fox, meet henhouse. Again. What was I saying about medicine not being a monopoly? Well, OK, it’s not a monopoly. But it’s sure a shootin’ a game of Monopoly, with hotels on every single street. And patients just have to keep paying up after every roll of the dice.